Looking for a portable wooden stanchion or landscape post suitable for outdoor use that can withstand the rain, humidity, freezing temperatures, desert sun, salty ocean air and wood boring insects such as termites? We have the solution! 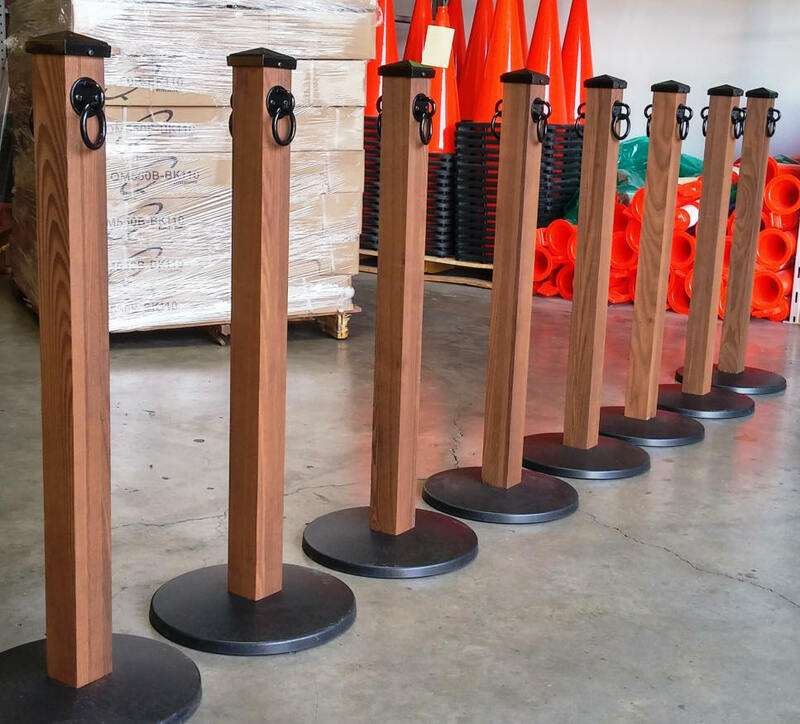 Our premium thermo treated wood stanchions, landscape posts and sign stands are very durable and resistant to inclimate weather, warping and rotting and insect. They are designed to provide many years of reliable crowd control both indoors and outdoors and have the guarantee to back it up. 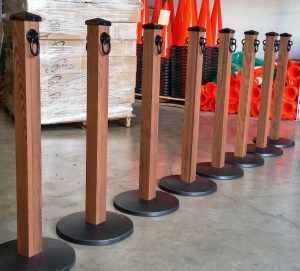 All of our wood stanchions are constructed from either Thermory Ash or Thermory Pine. We strive to be environmentally friendly and Thermory materials are enviromentally responsible. Thermory Ash and Pine are 100% harvested from sustainable and renewable North American forests. The thermal modification process used to dry the harvested wood is all natural and chemical free. Thermory Ash and Pine will out-perform and are a great alternative to exotic hardwoods harvested from precious and endangered rain forests. 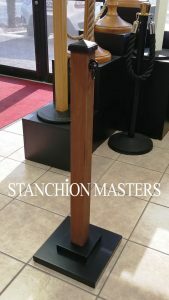 WHY USE STANCHION MASTERS WOOD STANCHIONS? The Thermory Ash and Pine wood used in our stanchions go through an all natural chemical free process called thermo modification that is used to change the wood cell structure and reduce the wood’s absorbency. Our stanchions will offer years of premium performance and durability turning your purchase into an investment. The thermo modification process make our outdoor stanchions much less likely to warp, bow or twist. Our wood stanchions are termite resistant and will remain resistant to rot and decay for 25 year or more. WHAT ARE THE ADVANTAGES OF THERMALLY MODIFIED WOOD? Durability: An approximate life span of 25 years can be expected for exterior applications. Indoor use life expectancy can be longer than a 30 year career. Chemical Free: Chemicals are not used in the thermal modification process, which makes this product an environmentally friendly alternative. If you choose not to stain your Thermory Ash and Pine stanchions, the wood will naturally patina to a gray color over time.